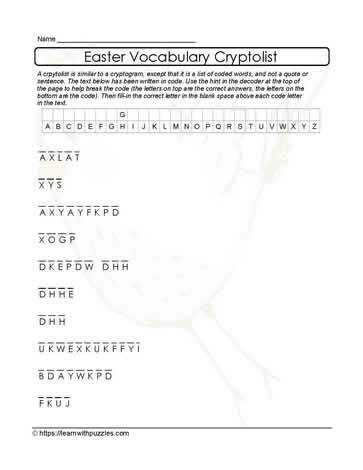 This 10 Easter words cryptolist puzzle with hint supports growth and development of students' vocabulary building skills, problem solving strategies, and makes learning fun. Hint provided in decoder at the top of the puzzle. Differentiate instruction as needed for ELLs in the classroom. Supports students in grades 3,4,5,6 classrooms, homeschooling and as tutoring resources for theme based activities.